David Lee Freedman (born 12 August 1956) is an Australian thoroughbred racehorse trainer and Hall of Fame inductee. In partnership with brothers Anthony, Michael, and Richard, he has been a prolific winner of Australia's major races over the past 20 years, with four Golden Slippers, four Caulfield Cups, two Cox Plates, and five Melbourne Cups, including two of the three won by Makybe Diva. On 19 June 2007 he won the prestigious King's Stand Stakes at the United Kingdom's Royal Ascot racecourse with his champion mare, Miss Andretti. 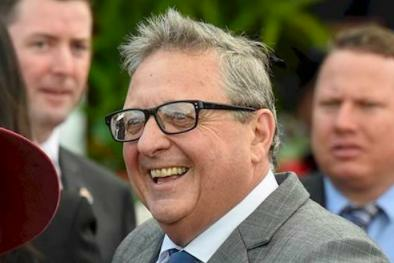 Lee Freedman gained an interest in racing at a young age when his father Tony took up horse breeding and training after retiring as a property developer. Educated at The Scots College in Sydney, Freedman studied at The Australian National University for a year, before making the decision to become involved in the breeding industry himself, running the stud farm owned by the family, near Yass in Southern New South Wales. Freedman quickly tired of this, and decided to branch out on his own as a horse trainer, initially setting up stables at Warwick Farm in Sydney. Training only a small team of horses, Freedman and stable foreman and brother Anthony found it difficult to train winners at Warwick Farm, where facilities were inferior to those at Sydney's premier track, Randwick. Freedman purchased the stable and home vacated by outstanding trainer Bart Cummings who had moved to Sydney. Freedman soon found success with classy filly Sauna, who was Group One placed and smart gelding Affected. His first Group One winner was another filly, Miss Clipper, who won the SAJC Australasian Oaks. Freedman's step towards training stardom came in the 1989 Melbourne Cup, when he trained the first two runners home, winning the race with stayer Tawriffic, ridden by Shane Dye, who was followed home by Super Impose. 'Super', as he was affectionately known, won eight Group One races, including the Epsom Handicap and Doncaster Handicap twice. His most famous victory was in the 1992 Cox Plate as an eight-year-old. Super Impose's form had been disappointing that spring, and was in the twilight of his career. The hot favourite for the race was another Freedman horse, the classy Naturalism. At around the 600m mark, Naturalism was involved in a fall. Super Impose charged home from last to win by a head, defeating 1991 Melbourne Cup heroine Let's Elope. The early to mid 90s marked Freedman's most successful era as a trainer. In this time, he trained a number of outstanding gallopers, including outstanding sprinter Schillaci, quality mare Mannerism, Mahogany, who won Group One races from 1000m to 2500m, as well as Melbourne Cup winners Subzero (1992) and Doriemus, who won the Caulfield Cup - Melbourne Cup double in 1995. Freedman also won an unprecedented four consecutive Golden Slippers, Australia's premier Two Year Old race between 1993 and 1996, with Bint Marscay, Danzero, Flying Spur, and Merlene. During this time, the combination between Freedman and stable jockey, Damien Oliver was the best known and most successful in the country. TODAY, Freedman has left Australian racing to take up a trainer's licence in the training facility vacated by legendary Kiwi trainer Laurie Laxon at Singapore's Kranji racecourse. He has not taken long to make his mark in Singapore, with early success with Mr Clint. Watch this space for more visits to the winners enclosure in his new base.